It's What I Wore Wednesday on a Tuesday! It was rainy in May. Like really rainy. It probably rained around 20 of the 31 days, and on the days it didn’t rain it was cloudy. I feel like we pretty much never saw the sun for the entire month, so we’re hoping for a sunny June! I also can't get enough of these tops! Anyway, let’s just get to the matter at hand… this month’s outfits! As always, I've linked as many items as I could find. The links for each outfit are under each picture. You look great in everything. Where did you get your red flower necklace? I have been on the hunt for something similar. Love the Friends and the patriotic shirts! I'm obsessed with all of these outfits! Especially those pineapple shorts - how cute! The friends shirts, the leggings, those scalloped red shorts! I love it all!!! Well, I was going to buy a pair of Zella leggings during the anniversary sale, but I am thinking I might not do that anymore! Random question - but how high does the waist go on those Amazon leggings? 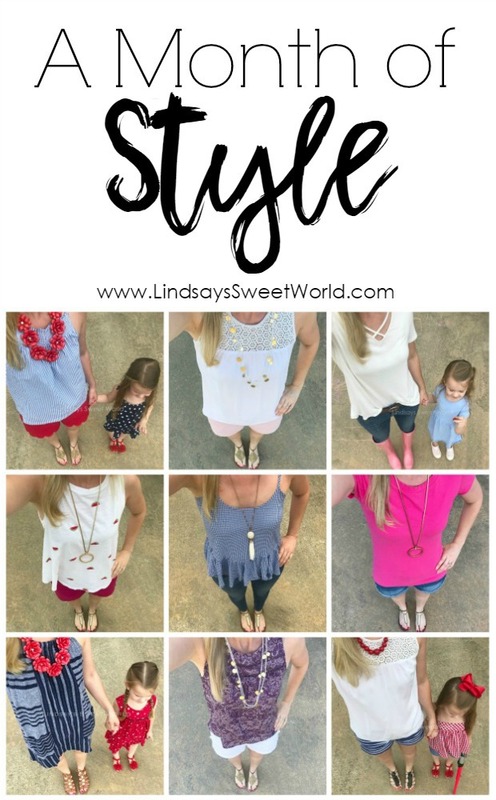 Love your style roundups! Don't forget to come over and link with Ageless Style and The Blended Blog this week! It's a perfect post.